Book Fest 2014, the annual sale of books by Anthem Authors’ members, took place on Saturday, December 6, from 8 AM until Noon. Hundreds of residents of Sun City Anthem, Henderson, Nevada, visited the main recreation center to make selections for personal reading and for gift giving during the holiday season. Mary Ann Unger, the president of Anthem Authors, and I shared a table. She sold numerous copies of her new murder mystery, Bits and Pieces. I had a successful day selling and autographing copies of Eagle Talons, The Iron Horse Chronicles–Book One. Many folks chose to take a bookmark with them containing information on how they can obtain a Kindle version of Eagle Talons from Amazon. 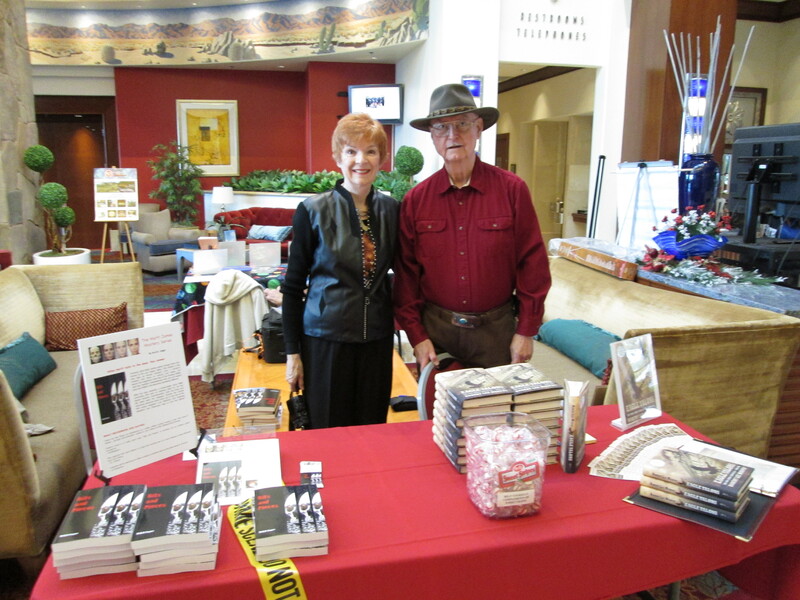 The next book signing event for me will occur on Friday, December 12, 2014, from Noon until 4 PM, in the Silverado Lounge at the South Point Hotel, Casino & Spa, at 9777 Las Vegas Boulevard, Las Vegas, Nevada. This special event, to sell and autograph copies of Eagle Talons, is not part of a larger book selling event, but is a one-of-a-kind happening arranged through the efforts of my wife, Barbara, and our good friends in the management and operation of South Point. As a special treat, our daughter Elizabeth, is flying in from California to lend a hand. She has sewn a period costume and will be dressed as Jenny McNabb, Will Braddock’s young lady friend from Eagle Talons. This entry was posted in Eagle Talons - Book One, Iron Horse Chronicles' Characters, The Iron Horse Chronicles and tagged Adventure Fiction, Eagle Talons, Fictional Character, Frontier Fiction, Historical Fiction, Jenny McNabb, Pioneer Life, The Iron Horse Chronicles, Western Fiction, Will Braddock, Young Adult Fiction, Young Readers. Bookmark the permalink. Your train is on the Marketing Tracks, for sure 🙂 I’m glad your sales went well at Book Fest, and am sure the same will happen in Las Vegas. I love that your daughter will dress up as Jenny McNabb!